A study that followed kids from ages 6-12 found that kids became far less active by age 11. Kids spend more time sitting and less time moving around. 6 year olds spend far more time moving than sitting. By age 12, this nearly reverses with kids spending nearly as much time sitting as they do moving. Girls in particular are at risk of being too sedentary. We've known for a while that physical activity declines in kids as they age. Toddlers are notorious for being rambunctious little pockets of energy. Teenagers meanwhile are known for spending many hours on the couch. In order to see how this transition happens, from little runners to couch potatoes, researchers gave activity trackers to 600 kids, similar to a fitbit, to see how physical activity changes with age. They found that kids started slowing down much earlier than they expected. 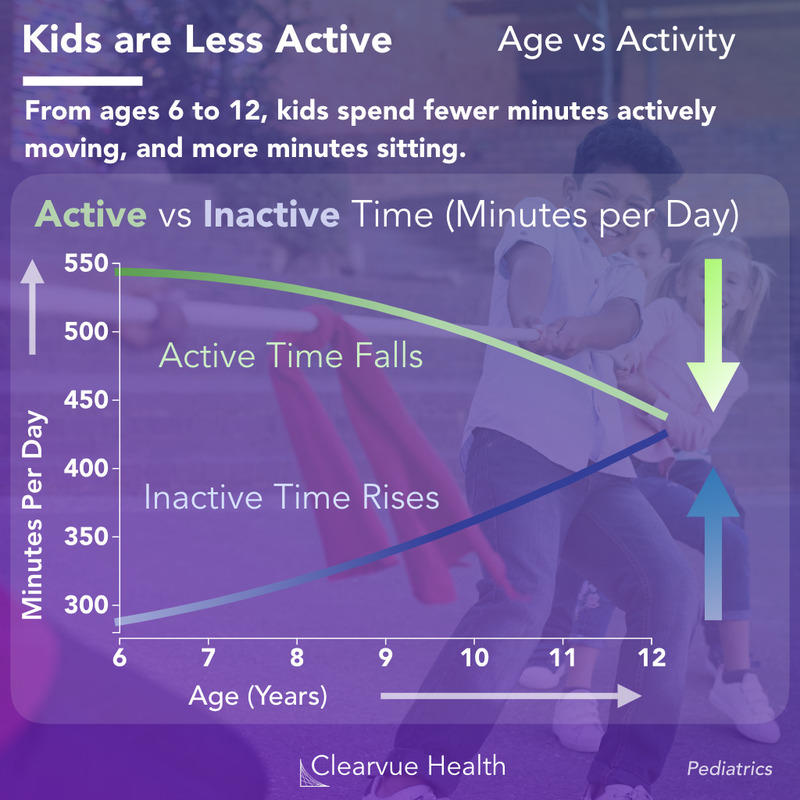 By age 6, kids had already started down the path towards less activity. At age 6, both boys and girls spent just over 9 hours a day moving around. This is very healthy. It helps prevent childhood obesity and it helps kids build stronger bones and muscles. However, this steadily drops every year. By age 12, kids are spending close to 2 hours less moving around and 2 hours more sitting on the couch. The pattern as shown above demonstrates that "active time" is substituted entirely by more "couch time." Moderate physical activity is particularly important for the development of muscles and bones in kids. This sets kids up for a lifetime of good health and habits. Unfortunately, moderate physical activity tends to become less common in boys and girls with age. By age 10, girls on average have dropped below the recommended 60 minutes a day of physical activity. 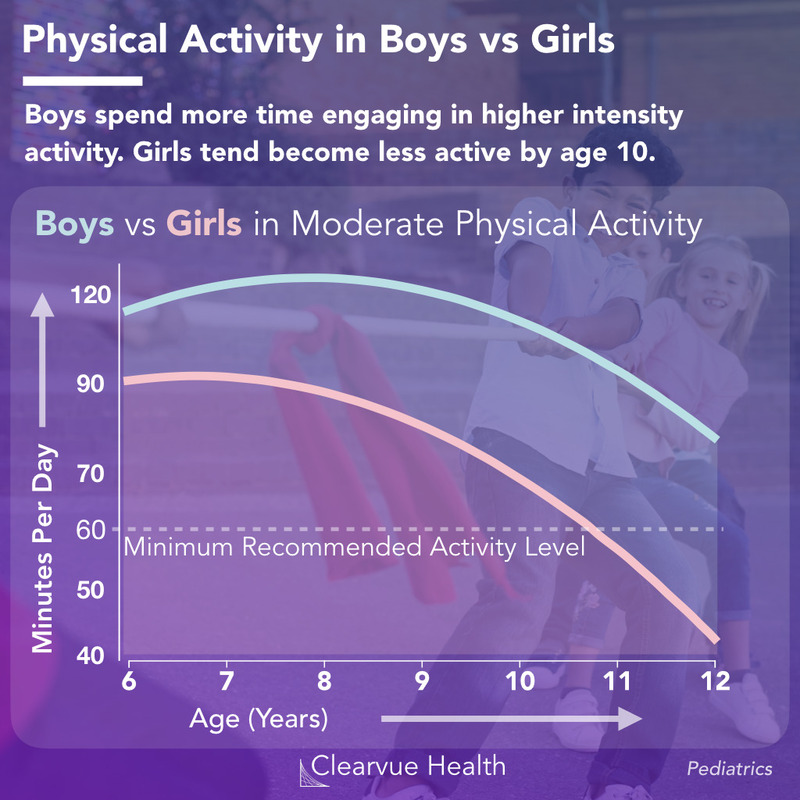 Boys spend more time moving around, and therefore stay more active than girls over time, but they also inevitably fall below the recommended 60 minutes of activity per day by age 13. While it may seem like play, physical activity in kids is essential for a lifetime of health benefits. As expected, it has been associated with lower obesity, which is important given our current child obesity crisis. The data on the "gender gap" in physical activity is particularly concerning. Girls need to stay active just as much, if not more, than boys. Bone strength in girls may protect them from osteoporosis as older adults. We at Clearvue Health hope this evidence helps to promote more sports for girls. Sports are not just fun, they're essential for good health. 1: Kids should exercise for at least 60 minutes a day between ages 5 and 17. As seen in the charts above, American kids on average fall below this threshold by age 10-13. 2: Most of this exercise should be in the form of cardiovascular and aerobic exercise, including walking, running and biking. This helps kids strengthen their hearts and their endurance. 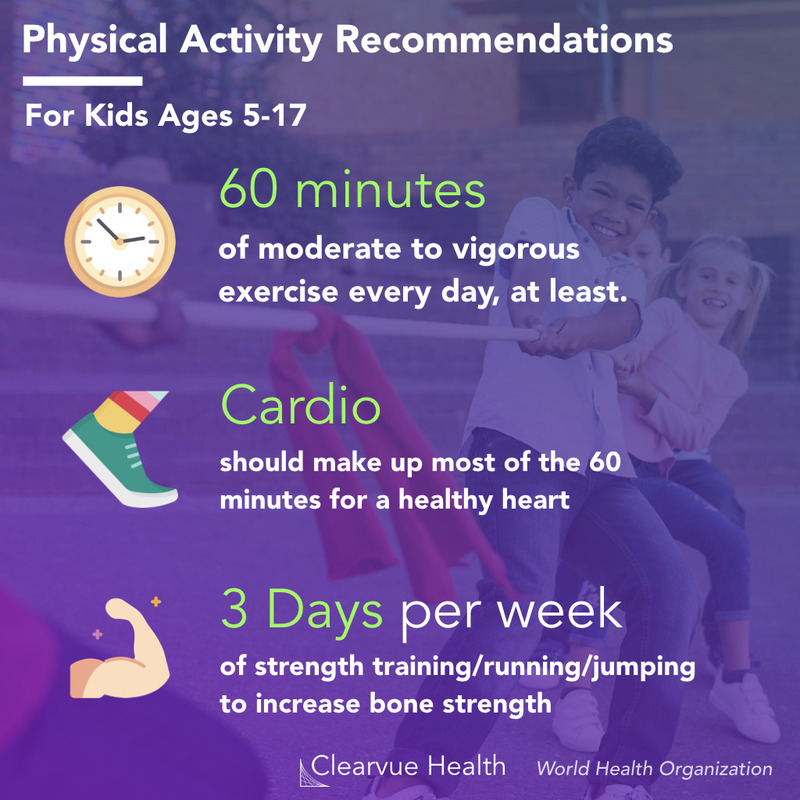 3: Kids should engage in some type of more intensive activity including running, jumping, or strength training in order to strengthen their bones.